The INSITER team is glad to announce that with the termination of the first INSITER year the first 360 degree feedback evaluation could be completed. The evaluation mechanism is an tool to ensure quality control during the project lifetimes by evaluating the implementation of the Jean Monnet Module INSITER and its core components, in particular the INSITER courses, events and study trips. Feedback was collected from students, lecturers and participants in both oral and written form. Also the appointed student representatives were given the opportunity to comment on the project agenda and ask questions to the academic coordinators in respective working meeting. Furthermore, during meetings in November 2016 and May 2017 the Advisory Board and Steering Board of INSITER positively assessed the activities of the project and agreed on the future steps to implement the project. On May 25, 2017 the second meeting of the INSITER Advisory and Steering Board took place in the premises of the Istanbul Policy Centre in Istanbul. The meeting served the purpose to jointly reflect on the programme implementation in the first nine project months and on the planning of upcoming project activities, such as the study trip to Paris and Berlin and the international simulation exercise in Brussels. On December 20, 2016 the first fully revised version of the INSITER webpage has been launched under the domain www.insiter.tau.edu.tr. It is home to information and up-to-date news on the Jean Monnet Module and is meant to be a major communication hub for the dissemination of project activities and results. On November 24, 2016 the first meeting of the INSITER Advisory Board took place in the premises of the Turkish-German University in Istanbul. The meeting served the purpose to jointly review preparatory work of the project team as well as a general planning for the upcoming project year. 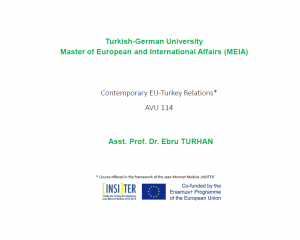 The Turkish-German University is proud to announce the positive evaluation by the European Commission of the project application by Asst. Prof. Dr. Ebru Turhan and Asst. Prof. Dr. Wulf Reiners for the Jean Monnet Module “INSITER – Inside the Turkey-EU Relations” for funding in the framework of the ERASMUS+ programme. The project will run under the grant agreement number “575084-EPP-1-2016-1-TR-EPPJMO-MODULE” from September 1, 2016 until August 31, 2019. Find the official selection results here.